Out of all the domestic wireless carriers, it’s evidently obvious that T-Mobile has been more open to offering devices from Nokia’s camp – not only the inexpensive flip phones from them, rather, some decent smartphones as well. Well, there’s something apparently brewing with the two companies, seeing that an event being helmed by the two is slated to occur in New York next week. Naturally, it’s almost hard to imagine the event to surround some sort of Symbian device, but instead, we could potentially see one of Nokia’s Windows Phones making a grand entrance into the postpaid world in the US. Still, it’s unknown if we’ll be seeing more than one device, but so far, it wouldn’t surprise us to see either the Nokia Lumia 710 or 800 joining Tmo’s lineup. In any event, it’ll be a short week before we find out what the fuss is all about. Yes, we’ve been grateful to see the Nokia Nuron and Astound a part of T-Mobile’s lineup in the past, but we’re feeling this new relationship that’s starting to form between the two. Let’s hope that Nokia’s presence expands beyond this one though. What could they possibly jointly announce that would save either of them from their separate impending fates of obscurity/irrelevancy (Nokia) and being eaten alive by their competitors (T-Mobile)? well, the FCC and MS took care of that already.. lol. it will probably be the 800, but with any luck we will see the 900 or some unannounced 12mpx carl ziess lensed dual core exynos super amoled + 1080p monster. ... or it could be the 800.. lol..
Nope. Lumia 710. Confirmed by the manual on the FCC. Check out WPCentral.com. they are going to have an event for the base line wp7 device?? lol LAME. i wish nokia made better phones. and not W7 ones. Who cares about Nokia using WP7? um anybody in the cell phone industry? oh absolutely... then they cuddof had a buggy os on fantastic hardware and in addition have to compete with samsung, moto, lg etc... i say buggy because we all know how well nokia is at developing their own software..
troll on, troll... troll on. There is no way that Nokia would enter the U.S. with a Flagship (Lumia 900) and stick it on T-Mobile! Besides, the cat is out of the bag given that the Lumia 710 is already featured on the Nokia U.S. website. Nokia will bring the high end devices to the two largests networks, most likely ATT first, given that ATT is the only network that is supporting WP with more than one device. Sadly, you are probably right, much like HTC (radar vs Titan). However, i hope Nokia will work to get each phone on as many carriers as possible and yes, the 710 is coming to T-Mobile, but i hope the 800 or something else too. This would seem to be a strange decision, as T-Mo is not in as many markets. But, they did release the HTC HD-7 first to a good audience, they were the first with the 2nd Gen WP (Radar) so maybe getting into the US market with them makes more sense than it looks. T-Mo will support it. And for those who still do not believe in the Nokia and Microsoft union- the sales on these two mid/range devices are strong, the tech reviews have been strong, and Nokia's profits will show a strong bottom line due not have.g to worry about investing in software, the same way Samsung, HTC, and every other hardware developer does it. 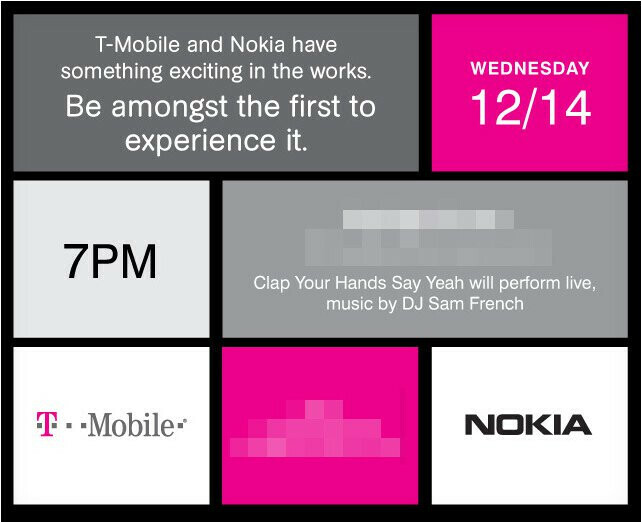 Nokia going ahead with T-Mobile on this first is the obvious choice. They have been very receptive to Nokia devices in the past. Once Nokia gets a foothold in the US market via T-Mobile, then you will likely see them go to other carriers like at&t and others. They're not going to shake up much. Like when HTC had an event to announce the Rezound with Beats Audio...I was thoroughly unshaken. Tmo initally launched Android, but fell behind especailly in regards to Motorola. But in regards to WP7 the HD7 was buried and had no display, a month later they acted like it didnt even exist. WP7s launch was all on AT&T they had multiple phones and ran ads, it wasnt until the HTC Radar that Tmo has seemed to get behind WP7. I'm thinking T-mo is finally going to quit trying to fight the iOS fight with AT&T, and the Android fight with Verizon/Sprint (Especially when it comes to Motorola since Tmo hasn't gotten much love from Motorola (Charm and Cliq). So as I mentioned when MS for some reason decided to partner with Apple for WindowsPhones launch, that was going to hurt them, they had to work with Tmo to different themselves. Now with the AT&T merger on the ropes, it makes since to take a lot of money from MS, and working with Nokia and HTC to promote WindowsPhone over thier subpar Android offerings. It would make them different, and give customers a reason to try them/check them out over the other carriers. Would not make sense to put lumia 800 or 900 with ATT. It be direct competition with Titan and Focus S. They'd be at a loss against Nokia! WP would lose in sales! Titan and Focus S are fresh products. They have to sell well! Can't have Nokia overshadowing them. The right decision would be to make Tmo pave way for Nokia enter US with lumia 800 or 900. With great ads and big push by Tmo, will be win win boths sides. Then rest of Nokia products could fallow to other carriers.